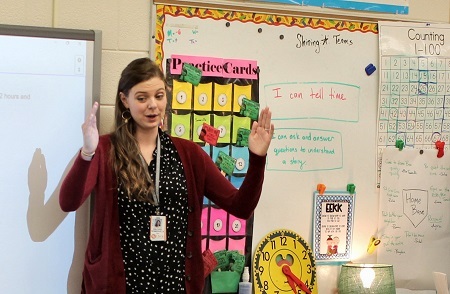 When Rachel Somerville found out she had been placed at Mocksville Elementary for her student teaching she was “over the moon excited.” That sentiment hasn’t changed as she has transitioned into a full-time first grade teacher at MES this semester. “The teachers at Mocksville have just been so supportive, so warm and welcoming. Everyone has come up and offered me help or provided help when I didn’t even know I needed it,” Somerville said with a smile. “They have made me feel like a part of the family. Somerville has always known she wanted to work with kids and has worked hard to make it happen. “Both of my parents were teachers before becoming missionaries, I had always taught Sunday School in Mexico, and my parents started a Christian camp which involved a lot of working with kids. I just knew that working with kids was going to be my passion,” she said. Born in Rutherfordton, North Carolina, Somerville moved to Mexico at the age of five, along with her seven siblings, when her parents became missionaries. “We all moved to Mexico in a 12-passenger van with a giant Newfoundland dog. It was like Cheaper by the Dozen all over again,” she said, laughing. After being homeschooled for all but one year of school, Somerville returned to North Carolina when she was almost 17 to finish high school, attend college, and get her teaching degree. She dual-enrolled at Isothermal Community College (ICC) in Rutherfordton where her older brother and sister were also students. While she was at ICC, Somerville and her dad researched the best education colleges in North Carolina, and Appalachian State University appeared first on the list. Her desire to find the best continued as she evaluated student teaching options. “They gave us a list of places we could go, and one of them was Davie County. I had never heard of Davie County, but when they mentioned that Davie County offered free housing for their student teachers and that they interviewed their prospective student teachers, I knew that that was where I wanted to be. …It set a really good tone for me of excellence and expecting excellence. Davie County became my number one choice. 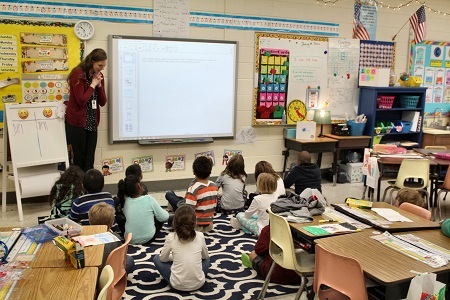 Davie County School’s good reputation, focus on technology, Kagan activities, and DavieLEADS initiatives were added positives,” she said. 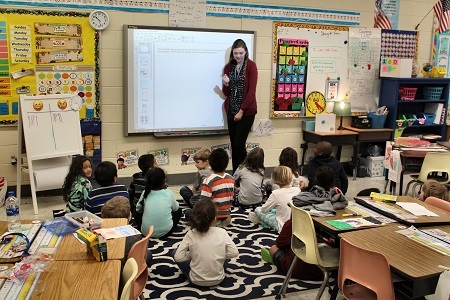 Davie County Schools began a close relationship with ASU in 2008 when the Mebane Foundation collaborated with the school system and Appalachian State University’s Reich College of Education to create the Mebane Masters program. This first-of-its-kind academic degree program allowed 15 Davie County teachers to remain in their Davie County classrooms while pursuing their Master of Arts Degrees in Instructional Technology. These teachers became their school’s primary resource for questions about the best and most pragmatic ways to maximize technology’s benefit in the classroom. 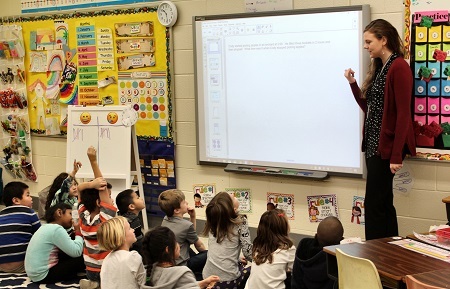 A student-teacher component became a crucial piece of the Mebane Masters Program. Over five semesters in 2½ years, 60 Appalachian student teachers were housed in Davie County, spending their 15-week semester paired with one of the 15 master teachers. The technology-rich environment created an intensive learning environment for Davie students, student teachers, and master teachers. 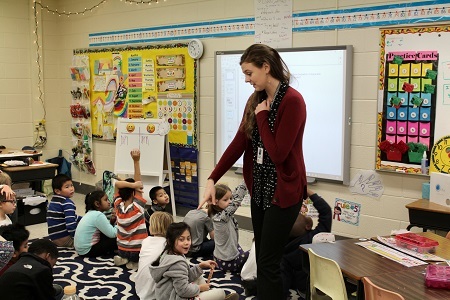 Although the Mebane Masters Program ended, the Davie County School system continues to maintain two condos to attract the best and brightest student teachers. “We want to be involved in helping train student teachers! Student teaching is a critical part of their education and preparation to step into their own classroom. In addition, hosting student teachers is one way we recruit high-quality staff since some student teachers are hired and stay with us. It’s a win-win!” she added. Impressed with Somerville’s work, Jennifer Swofford, principal of MES, approached her after a meeting and informed her that a spring semester position was opening up and asked if she would be interested. Somerville responded to Swofford’s offer with a resounding “yes”! Determined to keep Somerville in Davie County, Swofford and Haynes had considered the same thing. Fortunately, there was room this semester for Somerville to stay in the condo and it has benefitted all involved. “It’s wonderful to know that our investment in the Mebane Masters Program continues to pay dividends to this day in ways that no one could have anticipated, which is often the case with the best collaborative efforts,” said Larry Colbourne, president of the Mebane Foundation. Somerville is grateful for the opportunities she has received in Davie County.